SEVERAL mines in Goa fudged data in the environmental impact assessment (EIA) to get clearance from the Union Ministry of Environment and Forests (MoEF), shows an analysis by Gujarat-based Centre for Environment Education (CEE). Several others did not provide crucial information on land use pattern, water resources, biodiversity and air quality in EIA, it shows. Concealment or providing false information in EIAÃ”Ã‡Ãªcontravenes the EIA Notification 2006. Though CEE is yet to make the report public, its executive summary is available with Down To Earth. In 2011, following public demand, the Goa government asked CEE to assess the quality of EIA reports of 105 operational iron ore mines. CEE was also asked to examine whether the projects complied with environmental clearance (EC) conditions and took adequate steps to implement environment management plan (EMP) to mitigate the impact of mining. CEE experts analysed 95 mining projects and visited 17 mining sites between 2011 and 2013. The CEE analysis comes as a blow to Goa’s mining industry, already under fire from Justice M B Shah Commission. The commission was set up by the Union Ministry of Mines in 2010 to look into illegal iron ore and manganese mining in the country. In its report submitted to Parliament in September 2012, the commission stated that Goa incurred a loss of Rs 35,000 crore due to illegal mining. Following this, the state banned mining and MoEF kept all ECs for mines in Goa in abeyance. The summary of CEE report says that while going ahead with mining, hardly any leaseholder followed the process of public hearing adequately. Only one of the 96 projects assessed held public hearing at the project site. This when the EIA Notification states that the hearing should be conducted at the project site or as close to the site as possible. To avoid seeking clearance from the National Board of Wildlife, leaseholders fudged distance of mine lease boundary from protected areas, notes the summary. Because of mining, air pollution, water pollution, water turbidity and siltation of streams have increased in the state. Mining has also resulted in declining groundwater table and reduced agricultural productivity. Yet, these aspects were not discussed in the EIA reports, notes the summary. It further notes that EMP implemented by the mine leaseholders were inadequate to mitigate these impacts, particularly abating air pollution, waste dump management and managing traffic burden due to truck movement. Earlier, Madhav Gadgil, the ecologist who oversaw the analysis, had said in his draft report, that mining waste is turning into a major problem in Goa. So far, MoEF has granted ECs to 182 mines in the state with an annual production capacity of 70 million tonnes. 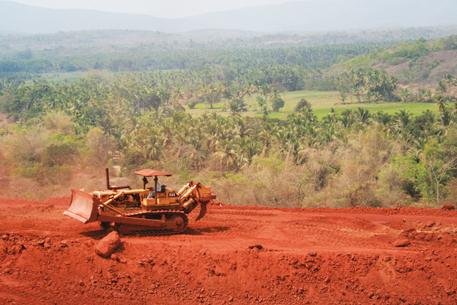 For every tonne of iron ore mined in Goa, three tonnes of waste is generated. This translates into 200 million tonnes of waste earth annually. “It is necessary to consider the cumulative environmental impacts of such a huge turnover of soil in an ecologically sensitive area like the Western Ghats,” Gadgil said in his draft. Besides, EC granted to a mining project allows dumping mining waste outside the mine lease area, whereas the Indian Bureau of Mines, which approves the Mine plan, does not allow this. Gadgil thus suggested that leaseholder should seek separate EC for dumping mine waste outside the lease area. CEE recommends establishing local committees to monitor whether mine leaseholders are complying with EC conditions. It also recommends capacity building of government departments to provide a mechanism whereby the state government may first review the EIA report and ask for revisions before passing it to MoEF for review. The consultant preparing the EIA report be held responsible for the data, states the summary. “Mining in Goa shows the way EIAs are being conducted. We need to make the clearance process transparent and accountable,” says Chandra Bhushan, deputy director general of Delhi non-profit Centre for Science and Environment. “We also need to make local communities stakeholders in the clearance process,” he adds.